Our repair facilities will repair all of your HYTORC tools and pumps. We can also repair all of your POWERTEAM pumps. We have an EXCELLENT turnaround! For more information please contact us or visit our repairs page. We can take care of your entire HYTORC tool and pump rental needs. We can help you with your next turnaround or outage. Contact us for pricing. Tool and/or Gauge Calibration: Our repair facilities, upon customer approval, will calibrate your hydraulic tools, pneumatic tools, hand tools, and/or gauges and also provide you with a calibration certificate traceable to NIST standards. HYTORC On–Site Calibration and Repair eliminates down time in production and maintenance environments, and prevents the loss of tools in transit! The new mobile calibration and repair program from HYTORC will be available in nearly every major market in the US. The vehicles have been fully customized to include the latest mobile calibration technology from AKO Torque in a climate-controlled environment with the ability to calibrate hydraulic and pneumatic tools up to 20,000 ft-lbs. In addition to the mobile van, for your convenience, we also offer a mobile preventative maintenance trailer repair service for your tools and pumps. This ensures maximum uptime for all of your mission critical equipment. Contact our repair office for pricing and scheduling. 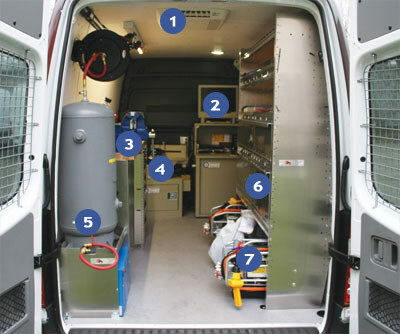 Our Mobile Repair/Calibration Vehicles provide ample room for trained technicians to inspect tools and pumps and provide calibration and/or repair services. Each vehicle is equipped with an air condition and heating system as well as LED lighting and heavy duty batteries to provide power in remote locations. Onboard computer system with wifi connectivity allows for instant printing of calibration records and torque charts as well as maintenance of customer inventory records, shared safety training videos and more. Each HYTORC Service Vehicle is equipped with all of the tools necessary to complete even the most complex of hydraulic torque wrench or pump repairs. New tool maintenance programs and extended warranties are available for free parts and labor on your tools. 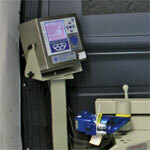 The latest mobile calibration systems from AKO Torque have been fitted into each service vehicle. These systems are cabaple of calibrating hydraulic and pneumatic tools up to 20,000 ft-lbs. For calibration of larger tools and manual torque wrenches, our van technicians will provide simple and fast on-site pickup and drop off. A full size air compressor is available on all vehicles for testing pneumatic torque wrenches and operating air tools required in some tool repairs. Powered through a 12V invertor, the air compressor can also be used in remote locations where no shore power connection is available. Our service vehicles carry a complete selection of the latest HYTORC hydraulic torque wrenches for long or short term rental. 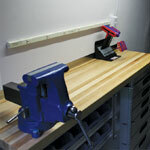 These tools are also available as free loaners should your equipment require extensive repair. All rental tools come with free maintenance during the rental term.